Anselma Palomin Arispe went home to join our heavenly father on July 9, 2018. Anselma was born on April 21, 1933 in Pharr Texas. She lived the majority of her life in Mathis Texas with her daughter and grandchildren. She was better known as Amá by her family, friends, and community. 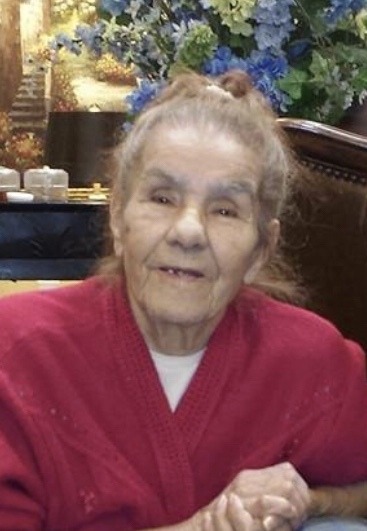 Anselma was a wonderful, beautiful woman with a huge loving heart who loved her daughter and grandchildren very much and never left their side. Anselma took a great passion in cooking, sewing, and gardening. She loved nature, loved to cook for everyone and loved to care for injured birds back to health. She was a woman of faith, who loved everyone and God unconditionally who accepted everyone equally. She is survived by her daughter Juana Maria DeLeon, Sisters: Majina Cameron Foster, Melinda Bennett, and Rosa P Koehn, grandchildren: Angelica Maldonado-DeLeon(Misty), Hubert DeLeon(Amberly), James Berlin DeLeon(Annie), Sara Jane DeLeon, several great grandchildren, great grandchildren, and great great grandchildren. A memorial service will be held at a later date and time in Mathis.